The site of the shuttered Miami Heart Institute could hardly have a more different future: It’s slated to become The Ritz-Carlton Residences, Miami Beach. The developer who is building an upscale condominium complex at the site tapped Ritz-Carlton to run the premises, which will have 126 residences, including 111 units in a 9-story condominium building and 15 single-family homes. 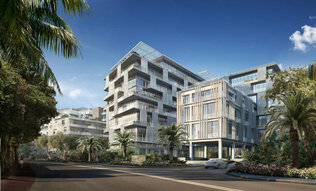 A rendering of The Ritz-Carlton Residences Miami Beach, which is in the works at the site of the former Miami Heart Institute. Lionheart Capital, a Miami Beach real estate investment and development firm, signed a 30-year licensing and management agreement with the prestigious hotel brand to operate the project planned for 4701 Meridian Ave., Miami Beach. “This will provide 5-star-hotel-style service in a fully residential community with no transient guests,’’ said Ophir Sternberg, CEO of Lionheart Capital, which has backing from a New York private equity firm. The deal is the second between Lionheart and the luxury hotel brand; Lionheart also developed The Ritz-Carlton Residences Singer Island, Palm Beach, which is 90-percent sold out. Maintenance fees for units will be about $1 per square foot per month, or about $3,000 on a 3,000-square-foot unit, which Sternberg said is “in line’’ with other luxury projects in Miami. Amenities will include, among other things, a 24-hour concierge, a spa and a restaurant managed by Ritz-Carlton, a private screening room, and a pool deck with waterfalls and cabanas. Lionheart purchased the nine-acre site in February 2012 for $20 million. Demolition of the former hospital is under way. Lionheart said it plans to keep just enough of the old structure to take advantage of the height and density, which would be virtually impossible to obtain on new construction in the single-family neighborhood. “Views are protected on all four sides, because it’s all single-family homes or water,’’ Sternberg said. Italian architect and designer Piero Lissoni came up with a contemporary design with mostly glass exteriors to take advantage of the waterfront views. Residences will have 12-foot ceilings, large terraces with summer kitchens and plunge pools in most units. Prices will start at about $2 million and go to about $25 million for penthouses, which will span some 10,000 square feet. The single-family homes will be in the range of 4,000 to 6,000 square feet and most will have private boat docks on Surprise Lake, which opens to the Intracoastal Waterway and Biscayne Bay. Meridian Investment Group was retained to handle pre-construction sales; the same firm is handling The Ritz-Carlton Residences project on Singer Island. The developer is building a waterfront sales center on the site and hopes to open within 30 days. “We’re trying to be open for Art Basel,’’ Sternberg said. The developer plans to require 40-percent deposits from buyers. That will include 10 percent of the purchase price at contract signing and 30 percent phased in during construction.